A team of biophysicists and engineers was able to create a natural-feeling prosthetic by taking a smarter approach to amputation. In this new approach, the scientists carefully rebuilt the relationship between opposing muscles (like how your bicep and tricep pull your forearm in opposite directions) and integrated a prosthetic limb with that muscular relationship. When they did so, patients felt a restored sense of proprioception – the ability to discern the location and movement of your limbs without looking at them. Shriya Srinivasan, one of the researchers on the MIT team, realized that amputation techniques had barely progressed since the American Civil War. Thus, she was inspired to see if there was a better way to do things that might give rise to a better integration of person and machine, she explained to Popular Mechanics. “It feels like… you put the bones back in my foot,” said one patient who was able to wiggle a brain-controlled neuroprosthetic foot. This occurred without any noticeable delay between the time the brain sent out the signal for the foot to move, and when the bionic limb responded. MIT’s Tyler Clites, who led the research, and his team conducted tests on seven people who received the improved amputations. In those tests, the individuals were able to wiggle robotic feet, climb steps, and do other tasks that many take for granted – but pose challenges for people with prosthetic limbs – without any major delays as their bionic legs interpreted the brain’s instructions. 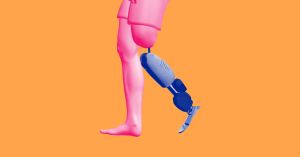 Work like this marks a major step forward in prosthetics research, as it approaches its ultimate goal of restoring total autonomy to people’s lives. This focus on the biological side of the interface of biology and engineering could lead to a future where amputation isn’t necessarily a last-ditch medical effort, but one where people can walk away and still do many (if not all) of the things they could do with their original limbs.